In this case, upon Sadie’s death John will be the beneficiary of the two checking accounts and brokerage account. Those accounts become his instantly upon Sadie’s death. John may be a great guy, collect the $300,000 and give each of his siblings $100,000 making sure Mom’s wishes come true. But John has no legal obligation to do so. If John does decide to honor his mother’s wish and split the $300,000 with his two siblings he will need to file an IRS gift tax return If upon obtaining title to the two checking accounts and brokerage account upon Sadie’s death if John is involved in a divorce or any law suit he is a defendant in, has any judgements or involved in bankruptcy, the $300,000.00 he received becomes an asset of his and subject to the proceedings he is involved in. Many client’s use beneficiary designations to avoid legal fees, i.e., probate fees or trust administration fees, at their death. One needs to be cautious about who they name as beneficiaries of their assets. If a client names a minor grandchild or incapacitated personas a beneficiary it could require a guardianship if the beneficiary designation is not properly defined With the proper estate planning documents in place those circumstances can be avoided. Take the opportunity to evaluate each of your assets and ensure your beneficiary designations as well as your Last Will and/or Trust states exactly how you want your money and other assets to be distributed at your death. 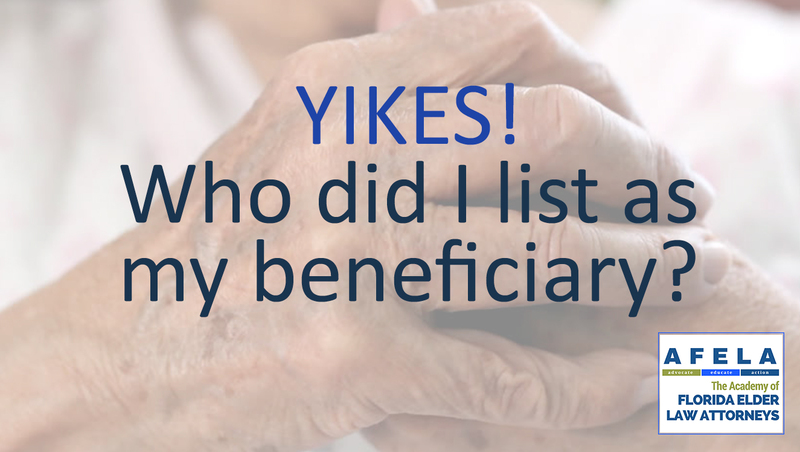 It is important to understand how to use beneficiary designations to your benefit and when naming a certain beneficiary may create more complications and expose the asset to creditors claims of that beneficiary. You do not want to be the story heard around town where the kids spent more money on attorney fee’s arguing over Mom’s estate than Mom’s estate was worth.